Find out about the differences in Seagrass, Sisal, Coir, Jute and Paper natural flooring. Total Flooring will be able to help you decide which flooring is right for you, whether it is one room, the whole house or a commercial property. Will we give you specialist advice on our products, how they are installed, fitted and after care. 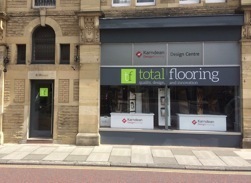 Visit our Design Showroom on Fenkle Street Alnwick, and view our wide range of flooring samples. One of our team members will be glad to help you and give you flooring advice. Free measuring & estimating service! A visit at home from our flooring experts will help you choose the perfect flooring. Some flooring, may require preparation of the sub-floor, to ensure the longevity and performance of your flooring. Total Flooring uses the best products for the sub-floor preparation before your chosen flooring is fitted by our qualified and accreditated team. See our wide range of flooring we have fitted in our gallery. To help you choose the right carpet flooring, for your needs, here is a basic guide to the different ways carpet is manufactured, the styles available and the fibres that carpet is made out of. See some of our custom, unqiue flooring designs we have cut and installed on site.